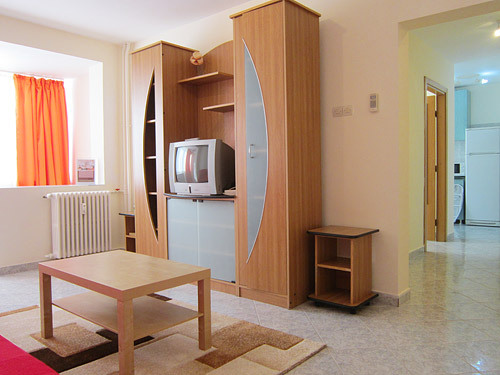 EastComfort's Bucharest apartments for short term rental represent the right choice if you wish to stay in Romania. After viewing the list of apartments try sorting the apartments by number of guests, price or our recommendations. This bucharest double studio apartment is an excellent rental solution for a family with/without children as it sleeps up to 3 people due to the extensible sofa. The living room has elegant furniture, sofa and armchairs and all the trappings of a comfortable location (the folding tea table, bookcase cable TV , large windows). The bedroom has a full size bed, wardrobe and night stands with lamps. The separate kitchen is fitted for self catering (gas cooker, refrigerator, cooking utensils). 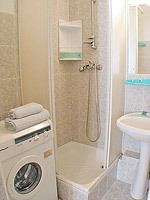 Besides the shower cabin, the bathroom has washing machine, toilet and lavatory. Well appointed near Unirii Square but also not affected by the traffic noise, this double studio is the prefect rental location for your stay in Bucharest, no matter the motive. Well located in the Unirii Square, it is an easy access to all great hang-out places: restaurants (Hanul lui Manuc, Horoscop), bars, clubs (Fire, Backstage), cultural centers or famous stores from Bucharest(Unirea Shopping Center).